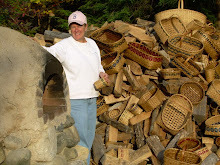 I’ve been a basket maker for 2 dozen or more years and many people would say basket case my whole life! 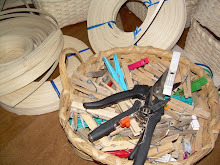 I love to make baskets and I love even more teaching basket making. Mostly I make and sell baskets prior to the holidays in order to indulge my children and grandchildren their every wish and desire! As our family tree grows my wish to sell more baskets increases, therefore I have recently renamed my part time endeavor JAJ Basketree. I've had lots of requests for an online way to purchase my baskets. So, here it is! If you like one of the baskets that you see on this blog, email me at janetjohnson@roadrunner.com -- If you have something in mind that you don't see here, just ask! My husband and I have lived and raised our 2 daughters in Freedom, NH. It’s a beautiful, small town, the picture of country living at its best. After I’ve made a bunch of baskets I stain them. This year not having gotten around to stacking this season’s firewood yet I choose this great place to put them to dry. We love cooking in our earth oven but not today – the baskets are too close! Every basket is unique. It all starts out with just a few supplies: many sizes of reed, several clippers, clothespins, a screwdriver and a big bucket of warm water. That’s it. No glue, no staples.